Analytics is an essential skill needed to run your business successfully. Common applications of analytics include the study of business data using mathematical & statistical analysis to discover and understand patterns which will help predict & improve business performance in the future. Analytics is an integral part of most businesses, and most successful entrepreneurs and business managers have generally been analysts in their own right, even if the analysis they have been doing has largely been intuitive. It was projected, sometime during 2013, that 90% of the world's data had been created during the preceding two years going back from that date. However, many businesses still lack the ecosystem, talent & orientation to process and analyze all this data in order to gain competitive advantages and new insights about their markets and customers. With the right analytical tools and algorithms applied to the pertinent volumes of data, major insights can be gained and strategies devised, particularly in the domains of Marketing, Customer Services and HR, among others. The accuracy of answers, based on key queries posed by functional managers in these domains, would also improve significantly. Forecasts and projections, based on intuitive analysis, often no longer deliver the competitive edge necessary for businesses to stay ahead. Analytics can be a rigorous and ever-evolving discipline and data scientists and analysts need to have a sound quantitative background and hands-on knowledge of the many tools, apps and algorithms needed to massage the relevant data and arrive at certain answers. However, it is up to the functional manager and professional to pose the ‘right questions’ and seek the relevant projections which will enable the business to keep its nose ahead of the competition. Identifying and Framing the Analytical Problem: A proper quantitative analysis starts with recognizing a problem or decision and beginning to solve it. In decision analysis, this step is called framing. Working with Quantitative People: Speaking of quantitative analysts, it’s really important for managers & functional professionals to establish a close working relationship with them. While you have the understanding of the business problem; your “quant” has the understanding of how to gather data on and analyze it. Understanding Different Types of Data and Their Implications: These days, you’ll hear a lot about big data and how valuable it can be to your business. But most managers don’t really understand the difference between big and small data. Understanding Different Types of Analytics and Their Implications:. 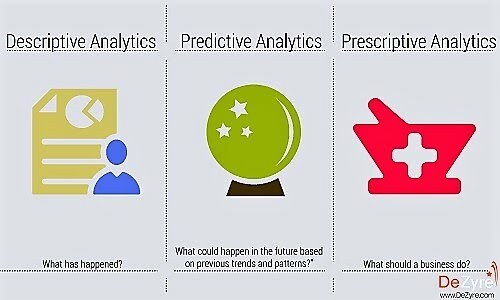 Predictive analytics use statistical models on data about the past to predict the future. Prescriptive analytics create recommendations for how workers can make decisions in their jobs. Exploring Internal and External Uses of Analytics: Managers & professionals need to be aware of the distinction between internal and external uses of analytics. While, historically, analytics were used almost exclusively to support internal decisions, presently, several companies are also using data and analytics to create new products and services. Putting Analytics to Work Yourself: ‘R’ is arguably the most widely used programming language for Analytics. A knowledge of ‘R’ programming equips a functional manager or executive to write programs for some of the analytics required for his or her functional area, without having to depend on the organization’s IT or data science team. This could include retrieving data from relevant internal & external datasets, managing and querying databases and developing algorithms which help to establish relationships between various datasets, leading to new functional & operational insights. Raja Mitra has significant operational & leadership experience in Operations, Marketing & Business Development, Project Mgmt. & Customer support for corps. like Bull, Olivetti, an IBM Subsidiary as well as for medium-sized enterprises & start-ups in APAC. His experience encompasses deploying Infocomm products & services in domains like Banking, Manufacturing & Distribution. Clients included HP, Oracle, Amex, State Bank of India, SMC Corp. & major publishing groups. In his leadership roles he had entered into partnerships with Microsoft & IBM ASEAN, on behalf of organisations he was working for. Raja has a Masters in Business Management from IIM, Calcutta and a Bachelors in Engineering (B.Tech.) from IIT Kharagpur. Dr. Sudipta Das graduated in Electrical Engineering and has subsequently done his Ph.D. in the same discipline, after doing his post-graduation in Control Systems. He has several years of industry experience and is currently an Asst. Professor in the Department of Data Science for a private University, where, among various subjects, he has also been involved in teaching ‘R’ & Python. He has a number of published papers in the domains mentioned to his credit and is a visiting scientist at the Indian Statistical Institute (ISI), involved in the areas of Statistical Quality Control & Operations Research. His research interests include Data Analytics, Stochastic Systems and Real-time systems. Interpretation & reporting results for Management.